So, our story opens up on twelve year old Sam London having all too vivid dreams about a real life, honest-to-goodness gryphon. From there, it’s one big reveal after another as we uncover the events documented by the Department of Mythical Wildlife that have to do with a threat so large it could endanger the world and all who live in it. First of all, let me say how well put together the lore of this story is. In the last two(ish?) decades we have seen authors do their best to blend myths and legends from all over the world to create their own universe. Some do it better than others but I gotta say that for a middle-grade tale, this world is pretty solid. It’s got that “Indiana Jones” big sprawling adventure type of feel which I like! And what’s more, it’s got a very gigantic nod specifically to lore from the Philippines. I mean, I appreciate it for what it’s worth, but because I am from there and know the lore pretty well, some “end game” plot elements to this book are kind of a dead giveaway. Still, it’s a novel thing to see familiar creatures from your homeland’s myths and legends wind up in good books and it's even better if they play a tastefully large part. Overall, the middle was a bit slow and uneven for me (mostly because I’m extremely spoiled by the Illuminae and Gemina books when it comes to “casefile narration”.) The book actually says that they’ve embellished the case files to make them more accessible, which is fine. It’s just that I would rather you went full case file or full narrative. To be honest, the story is good enough that even if the author didn’t include any inserts in “case file” format, it would have stood great on its own. At best, it was a novel and good attempt at really playing up the “super secret department” aspect of the narrative experience. At worst, it’s just extra info for the reader to do with what they want. However, despite all that, the book managed to surprise me with the big ending and the promise of even more of the world to uncover. 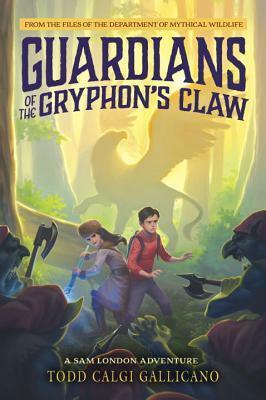 Guardians of the Gryphon's Claw will be out next week, so if you like mythical creatures, and adventures/quests so big you have to travel the globe to get things done, this book is worth a look! I don’t want to spoil it, but let’s just say I want to know what happens in the second book if there is going to be one.